L to R: Bridget Whelan, Austin Flynn, Bridget Flynn. The All-Ireland Senior Hurling Final Replay takes place at Croke Park this evening. In acknowledgement of this rare event our photo this week comes from 1959 and records a family celebration following the replayed final of that year where Waterford beat Kilkenny 3-12 to 1-10. 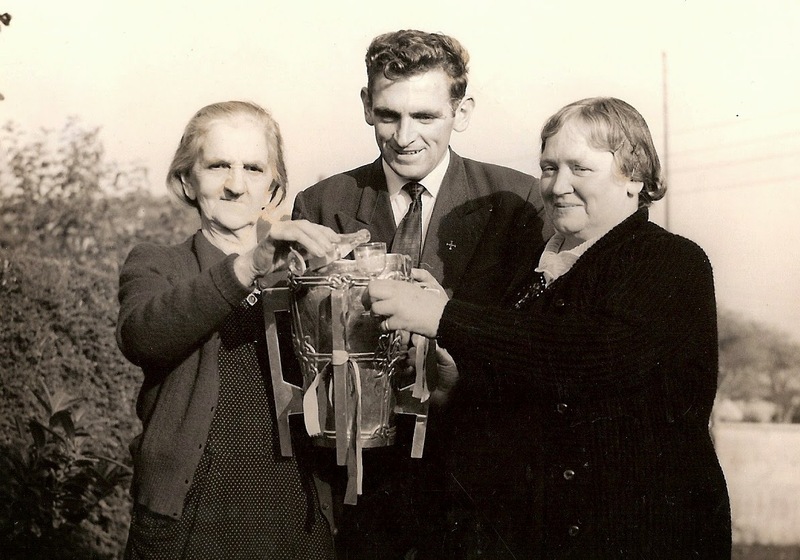 Austin Flynn, who played full back on the Déise team, is pictured with his mother, Bridget and Kathleen Whelan as they toast the Liam McCarthy Cup. Our popular Jack the Joker Fundraiser will continue this Sunday night in Minnies Bar where the Jackpot will be €8,000 as on Sunday night Paddy Sullivan was drawn out of the drum and picked card 12 which wasn’t the Joker though he did win €50. Dolores Kiely and Carmel Power won €25 each. As well as our group of ticket sellers tickets can be purchased from Convenience Store Ballinroad, Village Flowers, Spar, Mike Kiely’s Butchers and Mousies Takeaway. Our County Quarter Final game versus St. Saviour’s goes ahead on Friday night next, October 3rd at 8pm in Fraher Field. The Intermediate Western Final will most likely take place on Sunday October 5th in Fraher Field. This Sunday our Club Bingo returns to the CBS Hall at 8:30 pm where the jackpot is €1,450. Well done to our under 14 hurling team who last Friday night qualified for the County Final of the under 14 hurling championship after a hard fought victory over De Le Salle in Abbeyside in the semi final. The final now takes place this Saturday at 1 pm in the Fraher Field against Roanmore. Best of luck to all involved. Our minor hurlers played Ballyduff last week and after underperforming on the night we were beaten. However we have still qualified for the county semi final where we will play Clann na Gael tonight (Wednesday) in Fraher Field at 7:30 pm. A big improvement all round will be required if we are to reach the final. We were in action on Monday evening against Killrossanty in the Under 12 Town and Country Football League, whilst on Wednesday we played Tramore in the autumn hurling league, and we play Dungarvan in Abbeyside on Friday in the football league. We would also like to send out a best of luck message to Niall Buckley who picked up an injury during the game. Our underage outdoor hurling continues this Saturday morning the 27th September at the Burgery at 10:30am. All are welcome. This covers all age ranges from under 5 to under 10. Anyone who has not paid their membership yet is asked to pay it on the morning for insurance reasons. Membership forms will also be given out on the morning. Helmets are compulsory and if required can be purchased at a reduced price of €50. There will be a €2 cost also to cover expenses. Our under 16 hurling team played their last game of the year on Sunday morning last against Mount Sion. In a thrilling game of hurling and a high scoring game we lost out buy a point on a score line of 6-16 to 6-15. This brings an end to championship this year for this group of players and everyone in the club would like to thank them all for their effort throughout the year. Our under 11 team beat Kilrossanty in the Town and Country League while our Under 8 team were in action at the weekend when they took on the Brickies in a challenge game. Our popular Jack the Joker Fundraiser will continue this Sunday night in Minnies Bar where the Jackpot will be €7,800 as on Sunday night David Power was drawn out of the drum and picked card 35 which wasn’t the Joker though he did win €50. Margaret Cliffe and Liam McLaughlin won €25 each. As well as our group of ticket sellers tickets can be purchased from Convenience Store Ballinroad, Village Flowers, Spar, Mike Kiely’s Butchers and Mousies Takeaway. On Saturday evening last we played Kilgobnet in the Western Semi Final in Colligan and despite a brave effort by our side it was Kilgobnet who emerged victorious and advance to the Western Final where we wish them the best of luck. We would like to thank all of the players and management team for the commitment they have shown to the team throughout the year and all involved can be proud of their efforts. Our involvement in the County Championship came to an end on Sunday last as we were defeated by Mt. Sion in the quarter final in Walsh Park. Unfortunately we did not produce our best form on the day, but again we must thank the players and management for all the effort and dedication they gave all year. On Friday evening last a special mass was held in Abbeyside Church to celebrate the Diamond Jubilee of Fr. Richard Doherty. There was a large attendance at the mass showing the esteem in which Fr. Doherty is held by the people of our parish. After the mass Club Secretary Jonathan O’Donovan made a presentation to Fr. Doherty on behalf of the club. This Sunday our Club Bingo returns to the CBS Hall at 8:30 pm where the jackpot is €1,400. The U9's took part in the annual Roanmore Charity Blitz on Saturday 13th. 132 teams entered this year, the biggest entry in its 19 years. We split our panel in two, and group one started at 1pm in glorious sunshine against Douglas from Cork followed by a match with Rathgarouge/Cushinstown of Wexford. Last up was O'Loughlin Gaels from Kilkenny. After three close games the boys came out on top in all playing great ground hurling throughout. Panel: Daniel Morrissey, Darragh Walsh, Darragh Cosgrave, Ethan Keohan, Fionn O Murchu, Jack O Donovan, Jamie Mulcahy, Jake O Donnell, Kieran Cosgrave, Sean Walsh. Group two were up at half two with a game against Rathgarouge/Cushinstown’s second team. Then we met familiar opponents in the next game, Fourmilewater and finally Cork opposition in the form of Inniscarra. With group one performing so well the boys wanted to match them and duly they did winning all their games also. Panel: Sean Walsh, Sean Queally, Kyle Moloney, Jake Fitzgerald Drummy, Jack O Donovan, Conor Gough, Cormac Dunne Fitzgerald, Cathal Sweeney, Brian Callaghan, Billy O Connell. Well done to our lads, they played fabulous hurling on the day and proved ground hurling is not a thing of the past, and done the club proud. Big thanks goes to Roanmore for the invite and running a brilliant blitz, as you can imagine organising 132 teams must have been some headache, but manage it they did. Finally all of us wish Aodhan Barret a speedy recover from illness, hope to see him back training soon. Our under 8s also took part in this competition with a report coming next week. Our underage outdoor hurling continues this Saturday morning the 20th of September at the Burgery at 10.30am. All are welcome. This covers all age ranges from under 5 to under 10.Anyone who has not paid their membership yet is asked to pay it on the morning for insurance reasons. Membership forms will also be given out on the morning. Helmets are compulsory and if required can be purchased at a reduced price of €50. There will be a €2 cost also to cover expenses. All money outstanding on the cycle from Limerick fundraiser must be returned to mentors or committee members by Saturday 20th of September. Co-operation on this would be most appreciated. Our under 14 hurlers take on De La Salle in the county semi final in Abbeyside on Friday night next. Best wishes to all. We played two games in the under 16 championship in hurling in the last week. We beat Cappoquin on Tuesday night but unfortunately lost to De La Salle on Friday night .Our next game here is our final game when we take on Kilmacthomas. Result on this match will be included in next week’s notes. We beat Clonea in minor hurling county championship this week. Well done to all. Tonight we play Ballyduff Lower in Ballyduff at 6:15pm. Click here to see photos of Abbeyside's County Senior Hurling Championship Quarter Final clash at Walsh Park on Sunday last. Many thanks to Seán Byrne Photography for providing us with these pictures. 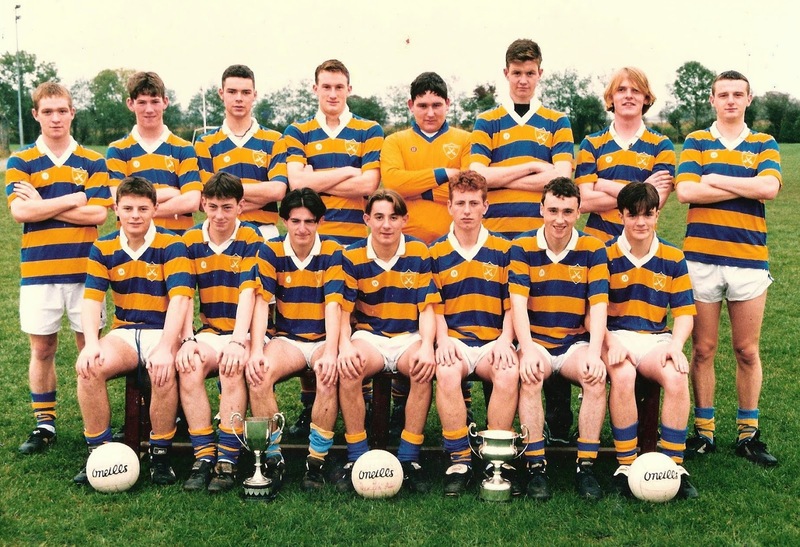 Back Row (L to R): Jason O'Donovan, Dermot Walsh, John O'Donoghue, Richie Duggan, James Brennan, Johnny Shields, 'Chopper'Hayes, Eoin Murray, Dermot Ryan, Patrick Veale, Dwain Moore, Paul O'Brien, Brendan Flynn. Front Row (L to R): Alan Landers, Jonathan Moore, Damien Cliffe, Jimmy Stacey, Brian Beatty, Brendan Landers, Gavin Breen, Michael Enright, Paudie Shields, Fergal Cunningham. 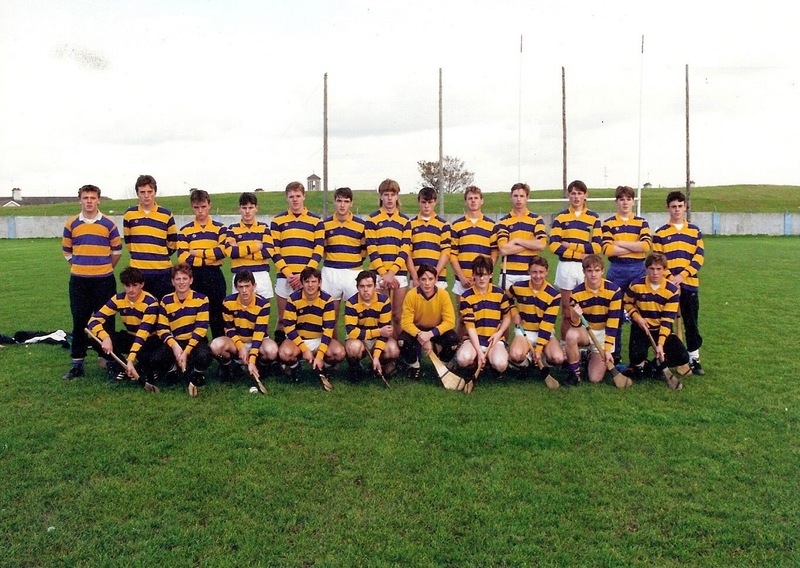 This week's photo comes from 1991 and shows the Abbeyside Minor Hurling panel that won the County 'B' title at Walsh Park. This victory marked a first title at the U18 grade since 1976. Our popular Jack the Joker Fundraiser will continue this Sunday night in Minnies Bar where the Jackpot will be €7,626 as on Sunday night Alison Kelly was drawn out of the drum and picked card 20 which wasn’t the Joker though she did win €50. Jim Egan and Kathleen Collins won €25 each. As well as our group of ticket sellers tickets can be purchased from Convenience Store Ballinroad, Village Flowers, Spar, Mike Kiely’s Butchers and Mousies Takeaway. On Saturday last we played Ring in the Western Quarter Final in Fraher Field and recorded a very good win. We have now qualified for the Semi Final where our opponents are Kilgobnet. This game goes ahead this Saturday at 6pm in Bushy Park. On behalf of all in the club we would like to wish Ian Kiely a speedy recovery from his recent illness. Ian is a member of our Junior Hurling team as well as training some of our underage sides. We hope to see Ian back playing and training the underage teams in the very near future. This Sunday our Club Bingo returns to the CBS Hall at 8:30pm where the jackpot is €1,350. Any member who wishes to put their name in the draw for All Ireland Football Final Tickets is asked to contact the Club Secretary by this Sunday night. Back Row (L to R): Paudie Shields, Laurence Hurney, Alan Beatty, Derek Hayes, Mattie Kiely, Gavin Keane, Declan O'Mahony, Derek Kenneally. Front Row (L to R): John Organ, Alan Moore, Benny Cliffe, Aidan Landers, Jonathan Moore (Capt. ), Brian O'Donovan, Michael Kelleher. This week's photo takes us back 20 years and shows the Abbeyside Minor Football team that beat Tramore in the 1994 'A' County Final at Walsh Park. This win saw the Village boys gain revenge for the two point defeat to the same opposition in the previous year's final. It was the club's first county triumph at this grade since 1982. Our popular Jack the Joker Fundraiser will continue this Sunday night in Minnies Bar where the Jackpot will be €7,452 as on Sunday night Aisling Hurney was drawn out of the drum and picked card 34 which wasn’t the Joker though she did win €50. Jim Egan and Jim Bob Dee won €25 each. As well as our group of ticket sellers tickets can be purchased from Convenience Store Ballinroad, Village Flowers, Spar, Mike Kiely’s Butchers and Mousies Takeaway. This Saturday we play Ring in the Western Quarter Final in Fraher Field at 3pm. On Saturday evening last we played Kilrossanty in round 5 of the County Championship in Fraher Field and recorded a good win. We will now face St. Saviour’s in the quarter final of the championship. TEAM: S. ENRIGHT, D. COLLINS, B. LOOBY, G. BREEN, S. O’DONOVAN, S. BRIGGS, C. MOLONEY, J. O’MAHONY, G. HURNEY, M. O’HALLORAN, M. FERNCOMBE, J. POWER, P. HURNEY, R. SHEEHAN, M. FIVES. We played Dungarvan in the Western Semi Final of the Western Championship on Thursday night last in Fraher Field and we came away with a very good win. We have now qualified for the Western Final where our opponents are Brickey Rangers. TEAM: R. RYAN, E. BERGIN, D. HENLEY, M. POWER, S. DEERING, P. LYNCH, E. ENRIGHT, L. HURNEY, C. PRUNTY, M. MAHER, R. DUNFORD, D. FERNCOMBE, T. MURRAY, D. LOOBY, D. POWER. SUBS: C. KINDREGAN, S. O’CONNOR, P. BERGIN, J. ELSTED, J. MOORE. The August Déise Draw took place on Friday night last and we had one winner on the night as James O’Mahony won €200. This Sunday our Club Bingo returns to the CBS Hall at 8:30pm where the jackpot is €1,300. Any member who wishes to put their name in the draw for All Ireland Football Final Tickets is asked to contact the Club Secretary by next Sunday night. Best of luck to our under 13 hurling team who on this Saturday take on Ballygunner in the County Final at the Fraher Field, Dungarvan. This team has done very well throughout the year and hopefully they will take home championship honours on Saturday. Support for this group of players would be most appreciated. The under 14’s have now qualified for the hurling semi final in Abbeyside on the Friday 19th. Well done to our under 14 players that took part in the Tony Forristal and Sony Walsh tournaments played last Saturday in Waterford and to Jonathan Moore the Tony Forrristal team manager. Dean Beresford, Dathi Brunnock, Ben Flynn, Shane Kiely, James O’ Riordan Jamie Walsh and also Meldan O’Dwyer who is currently out injured were members of the panels on the day. Our underage outdoor hurling continues this Saturday morning the 6th September at the Burgery at 10.30am. All are welcome. This covers all age ranges from under 5 to under 10. Anyone who has not paid their membership yet is asked to pay it on the morning for insurance reasons. Membership forms will also be given out on the morning. Helmets are compulsory and if required can be purchased at a reduced price of €50. There will be a €2 cost also to cover expenses. Tonight, Wednesday September 3rd we travel to Cappoquin for our next game in the minor Championship, while next Wednesday we host Clonea in Abbeyside. We played the Brickies at Bushy Park on Monday night last week and after a bruising encounter we came away with victory. Our next match here is Tuesday next week where we take on Cappoquin at home. In the Under 12 Town and Country League our lads beat An Rinn in football on Friday night last. Our under 11 team play this Friday night in the Town and Country League against Kilrossanty. Our under 10s also were playing in Abbeyside on Monday of last week against Fourmilewater. It is great to see so many young kids playing so many games at this time of the year. Click here to see photos of Ballinacourty's County Senior Football Championship match against Kilrossanty played at Fraher Field on Saturday night last. Many thanks, as usual, to Seán Byrne Photography for providing us with these pictures.